Beta-carotene is a member of the carotenoid family, which is a classification of compounds found in fruits and vegetables that can be converted by the body into vitamin A. These compounds give many fruits and vegetables their bright orange, yellow and red colors -- although many leafy green vegetables also contain significant levels. Beta-carotene is the most common carotenoid and also the most well known. Although beta-carotene is generally beneficial, there are a few circumstances in which taking too much may pose a health risk. Of all the known carotenoids, beta-carotene has the greatest potential to be converted to vitamin A. The only role beta-carotene has in the human body is to be converted to vitamin A, in the form of retinol. Vitamin A is important in maintaining vision, a healthy immune system, healthy skin, growth and development, among many other functions. In addition to beta-carotene, 2 of the most well-known carotenoids are lutein and lycopene. Approximately 600 other carotenoids have been identified. There is no established recommendation for beta-carotene intake, but the recommended daily intake for vitamin A is 1,000 retinol equivalents for adult men and 800 for adult women. Retinol equivalents are based on the potential for carotenoids to be converted to vitamin A. The human body requires 6 mg of beta-carotene to produce 1 mg of retinol. Vitamin A is not a common deficiency in the developed world, but remains a global issue affecting millions of people. The human body regulates retinol conversion, so vitamin A toxicity is not seen with beta-carotene overdose. 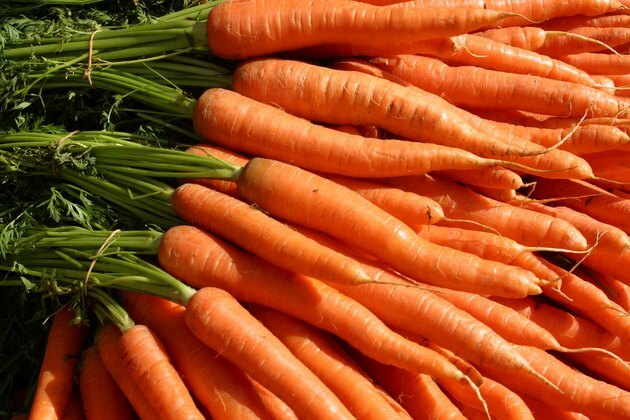 Chronic high doses of beta-carotene from food sources -- the equivalent of eating more than 2 pounds of carrots per day -- can cause yellowing of the skin and nails. These changes are reversible and pose no significant or long-term health risks. Beta-carotene supplementation, on the other hand, may have some negative effects. A study published in the "Journal of the National Cancer Institute" in November 1996 showed that smokers who took vitamin A and beta-carotene supplements had a higher chance of developing lung cancer as well as an increase in death from lung cancer, as compared to smokers who did not take these supplements. On the other hand, there is evidence beta-carotene supplementation has beneficial effects in healthy adults who do not smoke. Beta-carotene is most abundant in bright orange, red and yellow fruits and vegetables. Sweet potatoes and carrots are among the richest food sources, containing approximately 920 mcg and 810 mcg per serving, respectively. Spinach, kale and other leafy green vegetables also contain carotenoids, including beta-carotene. Multivitamin manufacturers often use beta-carotene as one of the principal sources of vitamin A.
Herb, Nutrient, and Drug Interactions: Clinical Implications and Therapeutic Strategies; Mitchell B. Stargrove, et al.